Diane Fanning’s next true crime book will be released by St. Martin’s Press January 2012. 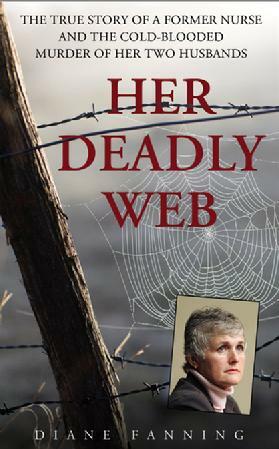 HER DEADLY WEB is about Raynella Dossett Leath, a fascinating story. It has a cattle stampede, an attempted murder, a three-shot-suicide, medical examiners threatening to shoot law enforcement officials, a secret city and a love child.Readers of true crime, and Fanning’s Fans are anxiously awaiting the release of HER DEADLY WEB. According to “Knox Views;” Raynella Dossett Leath was once the wife of Ed Dossett, Randy Nichols’ predecessor as attorney general. Ed, who was dying of cancer, met a very strange end when it was reported that he died after being stomped to death by milk cows. The story was that he’d asked to be wheeled out to the barn to see his cows and somehow ended up beneath their hooves. The whole thing always sounded more than a little strange, but it was accepted. The medical examiner — Randy Pedigo — ruled it an accidental death and word was that the widow collected triple indemnity. And that’s just the beginning of the story! AVAILABLE FOR PRE-ORDER ON AMAZON NOW! Raynella Dossett Leath said she came home one morning in 2003 and found her husband’s body in bed—covered in blood, a Colt .38 by his side. But authorities were suspicious of Raynella’s story. Why would her husband of ten years suddenly commit suicide? And if he had taken his own life, why did it appear that three shots were fired? David Leath was not the first of Raynella’s husbands to turn up dead. After digging into Raynella’s past, police unearthed bizarre, gruesome details surrounding the death of her first husband, who was seemingly trampled by his own cattle. Which led investigators to wonder: Could Raynella have staged his death, too? To those who knew her, Raynella was a loving mother of two, a good neighbor and friend, a nurse who always reached out a helping hand. Was this woman capable of killing both her husbands? And if so: Why did she do it—out of greed, jealousy, revenge? This is the story about what dark secrets were lurking inside HER DEADLY WEB. This sounds like a fascinating story…. A female perpetrator with murder on her mind down on the farm. Can’t wait to read or hear about the investigative twists and turns on this one! Three cheers for Diane!